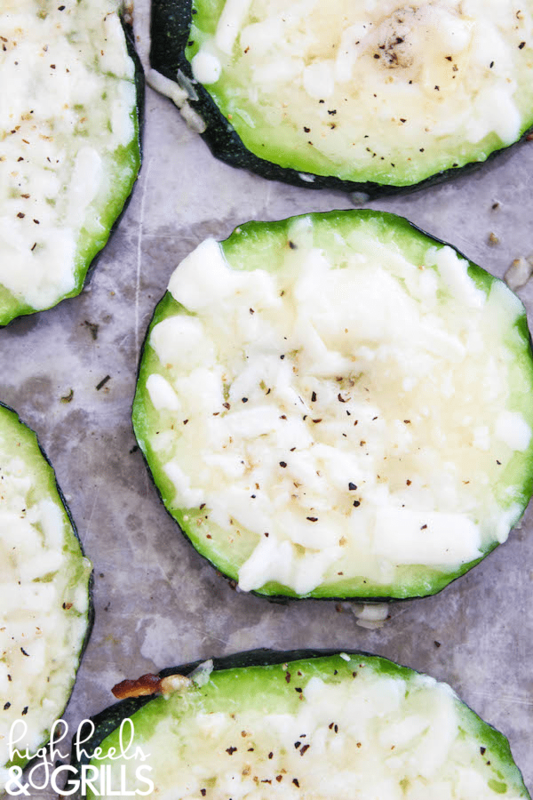 These Grilled Three Cheese Garlic Zucchini Rounds are the only way to eat zucchini. They are ridiculously easy to throw together and taste so good. Hello friends. So, we’re going deep in the thought realm for this post. I’m talking Kepler 45 deep (get it? Anyone? No?). Have you guys ever thought to yourselves how complicated this world has become? I mean, we have all this modern technology to “make life easier,” when in reality, when said technology becomes the norm – and even a requirement to live the way society says you should live – it further complicates life. A century ago we didn’t have microwaves, cellphones, cars, even multi-bladed razors. Yet, in today’s world, if you don’t have things things you are strange, and probably without a job. Barely more than a decade ago I had to get directions from a neighbor if I wanted to find the closest bowling alley. Now, that takes me 10 seconds to look up on a smartphone. Yet, this same smartphone makes life so “productive” that it fills up every last space of my life with… stuff. Recently, I got rid of my smart-phone, however. I now have a flip-phone. Similar to the kind you used in 1587 to call William Shakespeare over for dinner. I’m saving money and I’m saving time. Do you realize how much time you waste on smart-phones!? Go without one for a week (or a year), and you will quickly understand what I’m saying. I simplified one aspect of my life, and it made life easier. What’s the point? The point is this. Life is so easy that I can wake up, have some plumbing pour hot water over my body – how it gets to my shower from the mystery water land is a complete enigma to me – and be clean in 10 minutes. I put a box of processed food in my belly, that I have no clue how it was made or even where it was made. I eat processed food because I live 45 minutes from my work which is 42 miles away and I’m running late. I then drive to work in a very expensive yet modest vehicle by today’s standards. This vehicle uses old dinosaurs and plants from deep inside the earth as fuel to turn a million belts and gears that contact the asphalt and propel me forward at astronomical speeds. I get home from work and mow my lawn with a machine that cuts a million blades of grass in 20 minutes. That lawn, by the way, uses about 6,000 gallons of water per month to keep green (true story, and mine is a small yard… process that little nugget will ya?). I order food from a computer without ever talking to someone. I get on my phone to research the next vacuum to buy on Amazon, and 15 minutes later the food guy is at my porch, even though he was 5 miles away 10 minutes ago. I ordered food because I’m running low on time. Why am I low on time? Because I live 45 minutes from work, 42 miles away – and I’m supposed to be there again in 10 hours. You see? Life has become so easy, that we allow it to complicate everything! Things take up all our time and attention – so much so that we find ourselves stressed, overworked, under-rested, and unhappy. So simplify people! Seriously. Let’s simplify a little bit. Now, I’m not recommending you become like those guys on those prepper shows. You know, that show where some guy from Tennessee builds a bunker with 281 years worth of food and water for himself along with 4 million rounds of ammo to take out Iran when Iran decides to invade his bunker… in Tennessee. No, I’m not saying that. I’m saying this: Maybe instead of going to the store to buy food, try making your own. Literally MAKING your own. Take my zucchini for example. I grew it myself. I used a $3 packet of seed from last year to grow a 12 inch long 5 inch wide zucchini. I didn’t go to the store for it. I know where it came from. I know that it doesn’t have fertilizers, pesticides, or herbicides all up in its…insides. It’s mine! And it’s delicious and oh so simple. Okay, enough rambling. 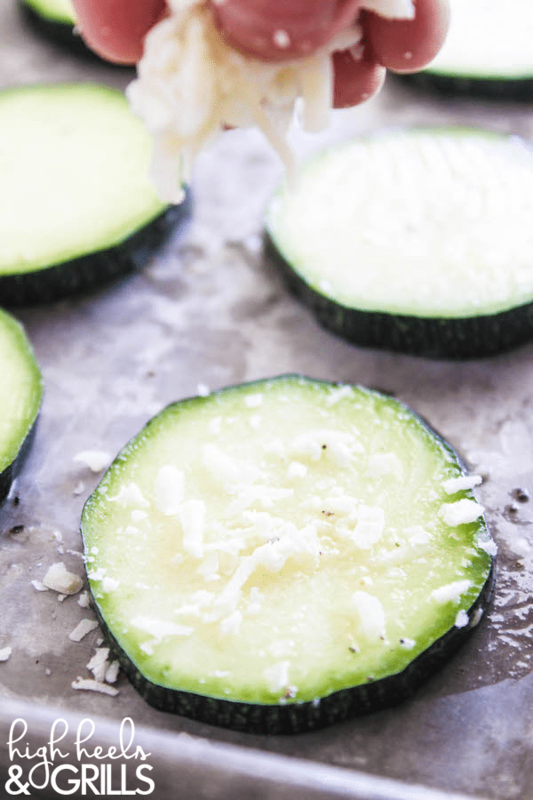 On with the recipe for these delicious Grilled Three Cheese Garlic Zucchini Rounds. Just simplify people, and be happier. That’s all. Get your grill fired up and nice and warm. You want to get it to about 400 degrees. Or, if you REALLY want to simplify things, start up a fire. Just not indoors. Please. Make garlic butter by combining the butter and garlic... imagine that. 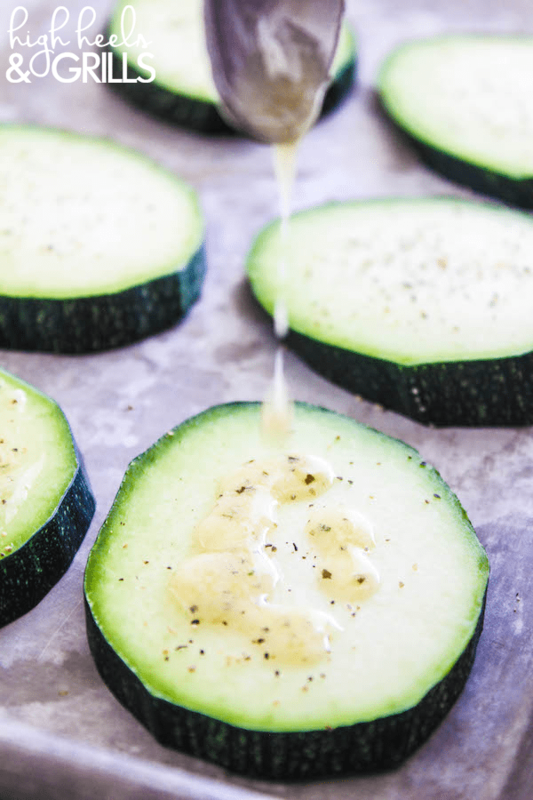 Lightly baste each side of your zucchini rounds with the garlic butter. Toss together the three cheeses until well incorporated. Dress one side of each zucchini round with about 2 tablespoons of the cheese mix. 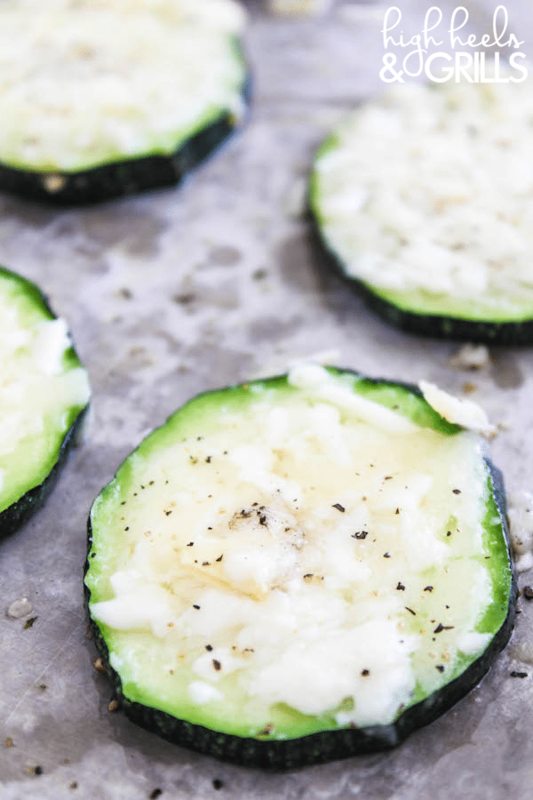 Grill your zucchini rounds (cheese side up, of course) for about 7-9 minutes. 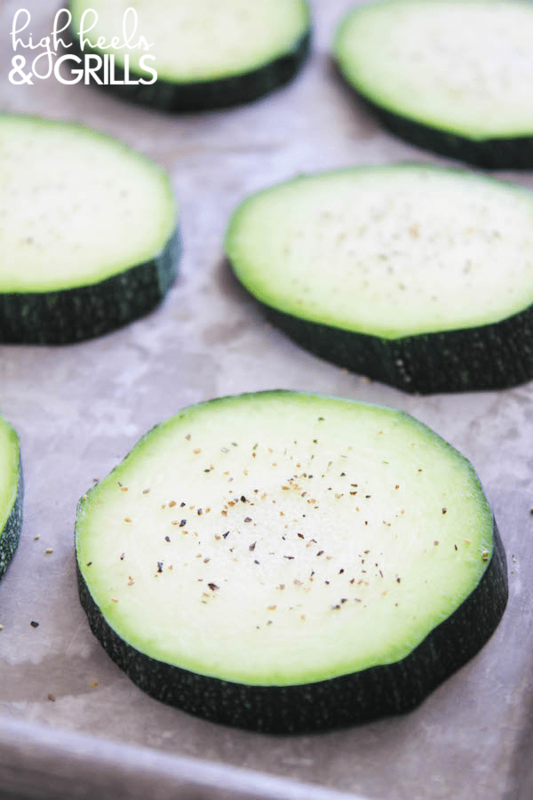 These zucchinis hold a surprising amount of water, so it's doubtful you will burn them. On the other hand, zucchini ain't like a rib eye steak - rare is NOT good - so make sure you get them nice and done.